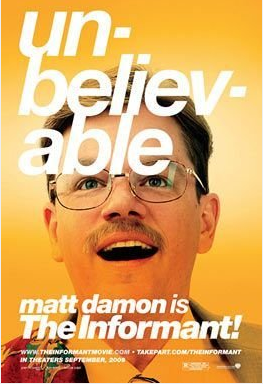 Synposis from IMDB: “Based on Kurt Eichenwald’s 2000 book, “The Informant” is the tale of Mark Whitacre (played by Matt Damon), an Ivy League Ph.D. who was a rising star at Archer Daniels Midland (ADM) in the early 1990s. The bipolar hero wound up blowing the whistle on the company’s price fixing tactics and became the highest-ranked executive to ever turn whistle blower in US history. Steven Soderbergh’s The Informant! is a confused, scattered film. This is not to say that I did not like it; Matt Damon’s charismatic portrayal of Mark Whitacre is more than enough to carry the movie. It seems like Soderbergh, however, couldn’t decide exactly what he wanted the movie to be. Is it a dark comedy, a mystery, or a joke on the audience? I realize that a filmmaker can combine genres, but this concoction doesn’t quite gel. Soderbergh also gives us a mixed bag of perspective. At times, we are left in the dark as to Whitacre’s intentions, victims to his lies just like the FBI. This would have been fine if we had been allowed to remain aghast and ignorant. We could have watched from a distance this bizarre man slowly unraveling. But then Soderbergh lets us in close; so close, in fact, that we are allowed to hear Whitacre’s stream-of-consciousness (in voice-over). I’m not sure that you can give an audience access to a select few of a character’s thoughts and remain genuine: If I were to photograph a room, and then ask you to look at the pictures and tell me how many chairs you see, and then told you that you are wrong because there was another chair behind me in the room that I did not photograph, would you be amused? I understand the director’s intent to lead us down the same path as the other characters in the story. We think we get to know Whitacre, and then we find out that we have been lied to. In that sense, it works. However, it made me very aware of the director’s manipulative hand, which pulled me out of the world of the film and into the world of recognizing cleverness. It is a strange thing to like a movie, be drawn in by an excellent performance, and then have a very talented director get in the way. His choices seem wrong, Damon’s right. The music (very similar to the music in the Ocean’s movies, where it works so well) is distracting and out of place here. This movie will go down as a bright spot in Damon’s career, and a small blip in Soderbergh’s. This entry was posted on February 28, 2010 by Ian Kay. It was filed under The Informant! (2009) .